Next time you sit down at your piano, try playing the melody line with your left hand. This will improve your eye-hand coordination and help you to play in a more fluid, relaxed and creative fashion. Whether you’re playing classical, jazz, pop, rock, blues or improvising …… spend a few minutes every time you sit down to play letting the left hand break out of the usual chord patterns routine and jump into the spotlight by playing melody. You will see an immediate increase in your left hand awareness, mobility and creativity. Post Relevent To: piano playing, piano playing tips, free piano tips, free piano lessons, jazz piano improvisation, piano improvisation, playing piano better, beginner piano, learn to play piano, left hand piano playing, creative piano playing. 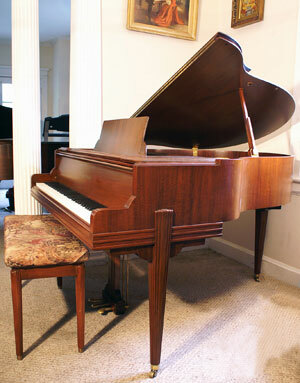 Piano For Sale – Art Case Baby Grand Piano Rebuilt Marshall Wendell(SEE SONNY VIDEO TOUR) $4500. FREE DELIVERY! Beautiful Art Case Baby Grand, Marshall & Wendell, Double reeded, brass saber with flower head legs. Just rebuilt, new hammers; dampers; pins; strings; bushings; key tops; re-shimmed/reinforced sound board; new “French Polish” finish applied (new coat of varnish applied to create even sheen/shine)plays and sounds beautiful. Marshall Wendell Pianos on parr with Chickerings, Knabes. A steal at $4900. rebuild and French polish alone would cost you $4K…Includes free delivery and set up in customers living room and one year repair warranty. Questions? Call Sonny Direct 631 475-8046. Free delivery anywhere continental USA. Watch Sonny’s PianoTV Show For More Free Piano Tips – Click Here! Piano For Sale – Steinway Grand Piano Model B 6’10” Ebony Free Delivery! $28,500. FREE DELIVERY! (VIDEO TOUR COMING) Pre-owned Steinway Baby Grand Model S 5’1″, Gorgeous Mahogany, deep, rich grain, made in 1941, all excellent condition original parts including perfect ivories, action just regulated, furniture jusst received a “French” Polish (coast of varnish applied over the original finish to even out sheen) Great sublime Steinway tone and action response. WARRANTY & FREE DELIVERY ANYWHERE CONTINENTAL USA. Questions? Call Sonny Direct at 631 475-8046. Rare Art Deco Case, African Mahogany Mason & Hamlin Baby Grand Piano symmetrigrand 4’11”. New hammers and keytops, new satin finish. Rich classic “Mason & Hamlin” tone, sounds like a much larger piano because of patented tension resonator. Excellent condition inside and out. Elegant legs, art deco design. Very little playing time, served primarily as a furniture piece. One year warranty. Free delivery LI/NYC vicinity all else continental USA only $475 for delivery. Questions? Call Sonny Direct. Post Relevant To: Mason Hamlin, Mason Hamlin Piano, Mason Hamlin For Sale, Mason Hamlin Grand Piano, Mason Hamlin Symetrigrand, Mason Hamlin Symmetrigrand, Mason & Hamlin, Mason & Hamlin Piano, Mason & Hamlin For Sale, Mason & Hamlin Grand Piano, Mason & Hamlin Symetrigrand, Mason & Hamlin Symmetrigrand, Mason and Hamlin, Mason and Hamlin Piano, Mason and Hamlin Piano For Sale, Mason and Hamlin Grand Piano, Mason and Hamlin Symetrigrand, Mason and Hamlin Symmetrigrand. Click Here To See The Video Tip!